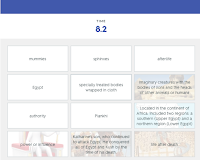 ACTIVITY: Ancient Egypt Quiz ~ Match Cards Online! Can you identify and match the following items? Words and images include cataracts, delta, pharaoh, mummies, Khufu, Middle Kingdom, and more! How fast can you make a match? The timer is counting down . . .